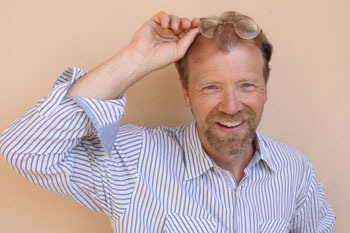 George Saunders G’88, professor of English in The College of Arts and Sciences, has been selected to receive the prestigious PEN/Malamud Award. Given annually since 1988 in honor of the late author Bernard Malamud, the award recognizes a body of work that demonstrates excellence in the art of short fiction. In addition to receiving a $5,000 prize, the Oneonta (N.Y.) resident will be recognized at a special ceremony in December at the Folger Shakespeare Library in Washington, D.C. Tickets for the event, which includes a memorial reading, go on sale in September. A former technical writer and geophysical engineer, Saunders has come a long way since joining SU’s creative writing faculty in 1996—the same year he published his first story collection, “CivilWarLand in Bad Decline” (Riverhead Books). (“An astoundingly tuned voice—graceful, dark, authentic, and funny—telling just the kinds of stories we need to get us through these times,” novelist Thomas Pynchon wrote of Saunders’ debut.) Since then, Saunders has produced three more collections of short fiction, a volume of essays, a novella and a novella with illustrations. The PEN/Faulkner Foundation, now in its 33rd year, is committed to building audiences for literature and for bringing writers together with readers. This mission is accomplished through readings at the Folger by distinguished writers; the PEN/Faulkner Award for Fiction, the largest peer-juried award for fiction in the United States; the PEN/Malamud Award, honoring excellence in the short story and the Writers in Schools program, which brings nationally and internationally acclaimed authors to public high school classrooms in Washington, D.C., to discuss their work with students.